Often I find myself in concert in my car. Air microphone. Head dance choreography. I do it all. On the freeway. In the parking lot. Pulling into my garage. I do it everywhere.
. The CD I unwrapped at Ya-Ya Christmas this year is a mix of songs by artists who have performed at The Abbey in the past. As I thanked my best friend for her thoughtful gifts, I was already excited about the prospect of having a new soundtrack for my driving life. The old Jessica/Fergie/Rhianna/Killers mixes were stale and had long since been thrust beneath the seats of Bronwyn (my Jeep) in disgust. And while I remain loyal to KKIQ (FM 101.7 in the Tri-Valley), there's only so much of John Mayer that I can take without switching to talk radio for relief! Little did I know how much I would love my new CD. The mix includes several genres, singers of both genders, both bands and soloists. Beginning with the first track, I was hooked, but it was JJ Heller's song Small which I happily have running through my head all day! These words fall in even step with a pretty, thoughtful melody, and they are clear enough to hear and to consider. When a song is more substance than fluff, I appreciate it as poetry. JJ Heller, thankfully, accomplishes both. I intend to purchase an album or two as I cannot imagine that I wouldn't love the rest of her work. Beyond that, it's always nice to start my days with a dose of lyrical faith. If you're interested in hearing the delicate, acoustic stylings of Ms. Heller, please visit her website . She will also be returning to The Abbey next month as part of her 2009 tour. 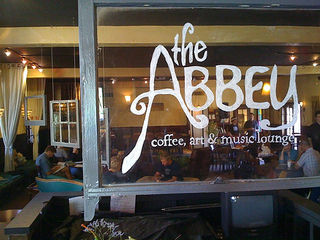 A schedule of artists appearing at The Abbey can be found on its MySpace page .